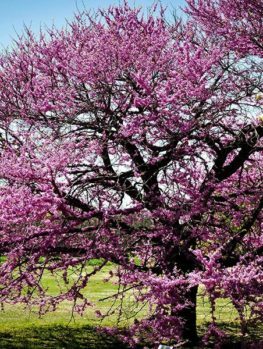 Some trees know how to attract a crowd when in flower and the Western Redbud stops the traffic with its beautiful soft-purple flowers all along the bare twigs in spring and attractive rounded leaves that turn red in fall. For grace and beauty this small tree is hard to beat and when you add-in drought and heat-resistance too you have a winner. 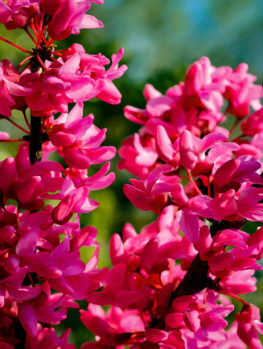 Western Redbud is a large shrub or small tree, reaching perhaps 20 feet. It grows well in hot, dry areas as well as in milder locations and will be happy in all kinds of soil. 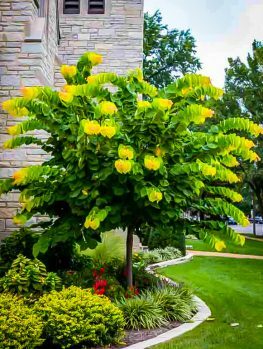 It is drought-resistant and grows into a beautiful rounded plant with several trunks, or it can be pruned into a small single-stem tree. This is an ideal choice for front-yard planting and needs very little care after it becomes established, which it will quickly do in just a few years. 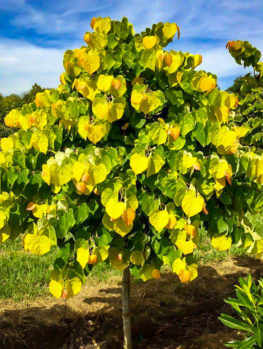 If you are looking for a spectacular large shrub or small tree and you live in one of the warmer, drier states, then Western Redbud is an excellent choice for your property. It is a trouble-free plant that bursts into wonderful bloom every spring, with clusters of magenta flowers all along the bare branches and even on the trunks. During the summer it will charm you with its beautiful heart-shaped leaves, and in fall it will dazzle with spectacular fall color as good as any maple. It grows best in a sunny spot, and although it is very drought tolerant, it will be lusher and fuller if you give it a good, deep watering from time to time during spells of very dry weather. 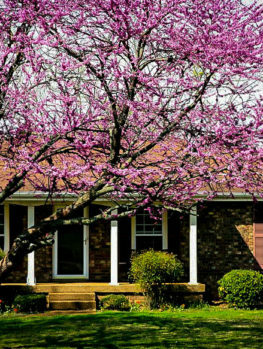 Western Redbud will grow two or even three feet a year, so it will quickly turn into a good-sized shrub that can be used alone or planted in a row to make a low or medium screen. It is an excellent choice as a specimen in the front yard, or mixed with other shrubs on a property of any size. It is also a great plant for attracting birds to your garden. Western Redbud is great for drier areas and will tolerate drought. During severe spells of dry weather, however, it should be watered well – but not too often. It is mostly free of insect pests and diseases and needs little or no care. It will tolerate almost any kind of soil from sand to clay, and from acidic to alkaline soils. 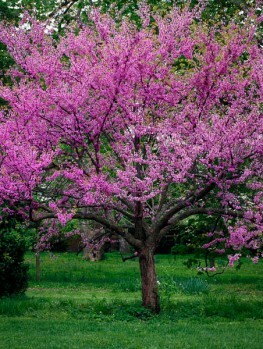 Western Redbud grows into a large, multi-stemmed shrub or it can be pruned-up into a small tree perhaps 20 feet tall. The violet colored flowers appear on the bare branches in spring, making a spectacular display that will lighten up your yard. The rounded green leaves will grace your garden all summer and then in fall they will put on a show of color as good as the forests of the east coast. Shades of gold and red will brighten the garden, before the falling leaves reveal an intricate network of bare branches with a smooth, gray bark. After the flowers reddish-purple seed pods will appear. 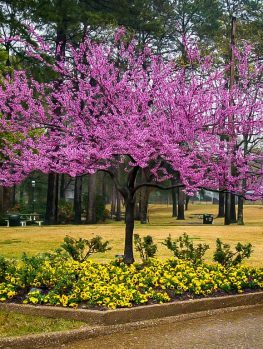 Western Redbud is hardy in zones 7 to 9, which means it will grow in the east as far north as Delaware, throughout the south and all along the west coast. It does however have one requirement that may limit where it can be grown. Western Redbud needs cool weather during the dormant season. If you live in areas where you never get close to 32oF, then there will not be enough cold to stimulate flowering. So areas that are hot in summer but get a little frost in winter are ideal for this plant. 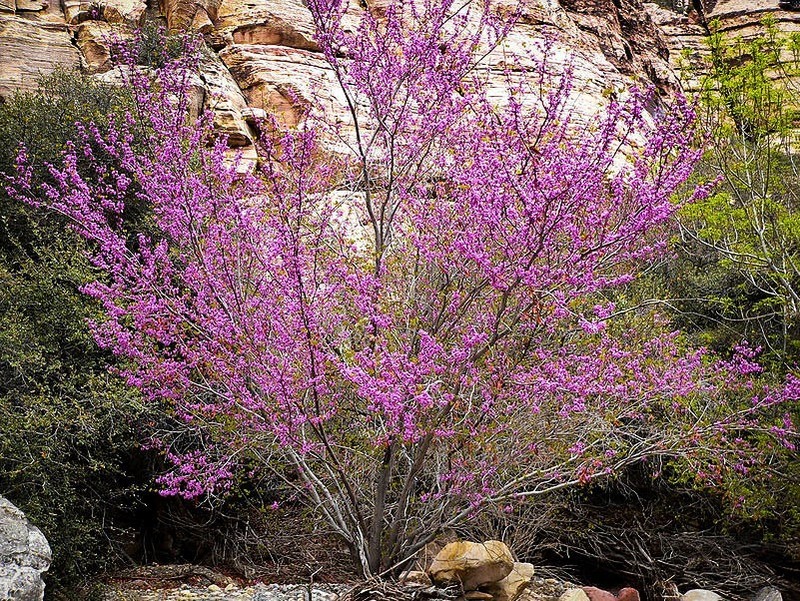 Often it is hard to find good plants for places that are hot in summer and cold in winter, so Western Redbud is an excellent plant for those kinds of locations. Young trees can handle 20oF and mature trees can even tolerate 10oF, so cool winters are not a problem. Western Redbud does best in full sun but will tolerate a little shade. It will grow well in hot, dry areas but does not like to be exposed to full drought conditions – give your tree some water during the summer or plant it near a stream or pond. When young it will benefit from some extra water to encourage good growth and perhaps a little fertilizer. 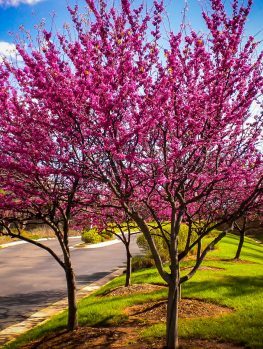 The Western Redbud will only need pruning if you are planning to grow it as a small tree, in which case you should remove the lower branches gradually as the tree grows. It can be grown as a tree with several stems, or pruned to just a single trunk. As a shrub it only needs some pruning to improve the shape, or if it is growing a little too big for the spot you have chosen. Redbuds all belong to the botanical group Cercis. They grow right across North America and Mexico, as well as in southern Europe and China. 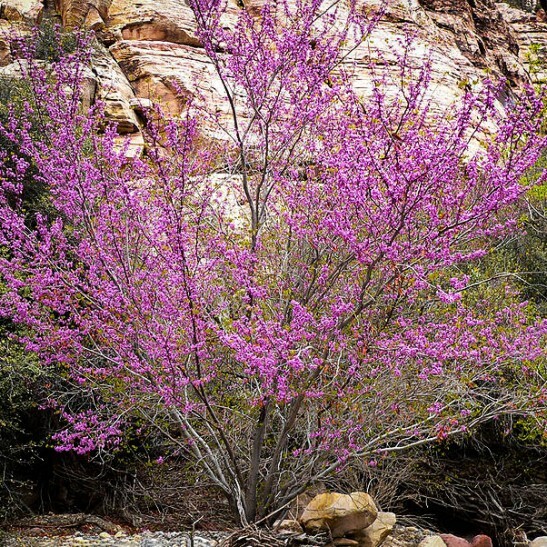 They are all fairly similar, but the Western Redbud, Cercis occidentalis, grows naturally in California, Utah and Arizona. Native Californians used this plant to weave baskets, as they young shoots are very flexible. The pods can be eaten, and so can the flowers. 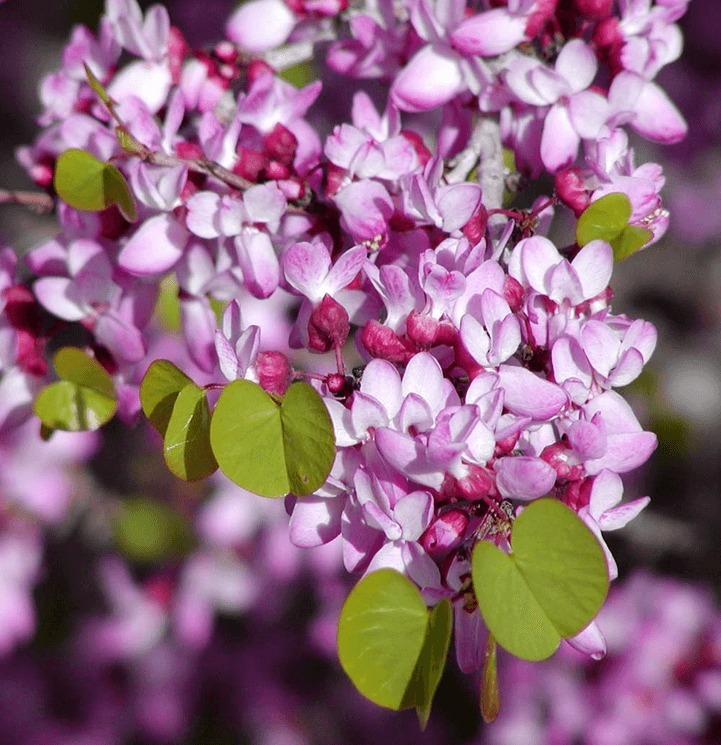 Western Redbud is produced from selected plants that have a good shape, flower well and are strong, healthy growers. Our trees are grown the correct way, from seed harvested from these selected trees. That way every tree is strong and healthy, just like its parents. However, these take longer to produce, so avoid cheaper trees that will only be a disappointment.